need to think about more than just watering. Gone Just a Few Days? to do much at all. into a bed or pile of wood chips or bark, and water all well. especially are great in hanging baskets, even if you aren’t going on vacation. pots will dry out much quicker than plastic ones. sort. You can even make one of these yourself. vegetables, and more special (or expensive) trees and shrubs. from leaves, and help keep away insect pests. athletic fields and golf courses. beds, or along garden rows under mulch. 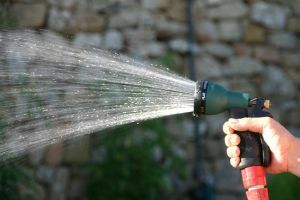 home and garden stores, that you put on the faucet and then attach to the hose. stress for them, and may be hard to get under control once you’re home again. high when you return, then mow once again and again lower in a few days. If you have repellents out for deer, make sure to rotate them or add new ones. rotated every few days around the garden. garden or fruits that are ripe, or that can continue to ripen once picked. Otherwise they can get too large, lose flavor, rot, fall off, and cause disease. benefit for them to help you. to water and tend the plantings until they become somewhat established. thank you gift for your plant sitter!